Born March 5, 1925 in Belfast, Northern Ireland. Emeritus Professor at Nottingham University; Senior Research Fellow, Shell Centre for Mathematical Education, Nottingham University. Sc.D. (Cambridge); D. Eng. (Honoris Causa, Kyoto), Honorary degree of Doctor of Science by the National University of Ireland (2004). Matrices and Tensors, Pergamon Press, 1963; Applied Group Theory, Longman, 1967; Molecular Solid State Physics, Springer, 1991. More than 200 papers. 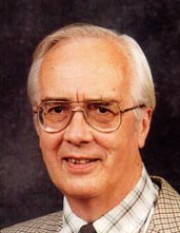 With Sir John Lennard-Jones, I worked on the rigorous formulation of the Hartree–Fock theory for molecules. This included the derivation of the molecular orbital equations in matrix form. The use of localized equivalent orbitals as a link between calculated quantities and chemical models was established and led to a semi-empirical theory of molecular ionization potentials. The concept of corresponding orbitals was defined, with A.T. Amos, and proved useful for unrestricted Hartree–Fock theory. A variation principle for the Schrödinger equation using a Green's function was proposed which is superior to the usual one but more difficult to apply. I showed how accurate representations of the electrostatic field within and around a molecule could be derived using, as a variation criterion, the minimum error in the electric field. In particular, using a theorem on the asymptotic form of integrals over Gaussians, this leads to improved point charge models. Electrostatic treatments of solvent effects have been explored. With K. Collard, I showed how differential topology could be applied to classify the critical points in the electron density and to follow their creation in the course of molecular formation. In the graph theory of hydrocarbons, I have exploited the alternant property to find more efficient methods of calculation. The graphical invariants are natural quantities with which to analyse the total energy. This investigation continues to produce unexpected results. In my second book, I proved that all the results of group theory, needed for molecular applications, could be derived, very simply, using only the group character algebra. Current work, with D. Rees, explores the relation between atomic hybrids and numerical quadrature.